Imagine setting out in a boat from Sydney and heading to Port Moresby in Papua New Guinea. A long way you will agree. Imagine going the same distance south from Sydney. This will put you past Macquarie Island (part of the Australian Antarctic Territory) and just a little way north of the South Magnetic Pole and just off the actual Antarctic coastline. Well, in late 2000 I travelled to a location the same distance from the equator but north, not south. 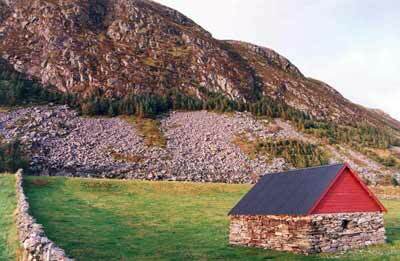 I travelled from Sydney in Australia to Norway to dive the fiord area of this country. How did I get involved in this epic dive journey? Well, in August 1999 I was contacted by Riki Virc of Sweden. He was coming to Sydney to study and work for about six months and he wanted to do some diving. He ended up joining the St George Scuba Club of which I was at the time President. He came away on a couple of our trips and dived many weekends with us. When he returned to Sweden in February 2000, we kept in touch via e-mail. In mid-2000 he e-mailed me that his dive club, the Malmo Sundsdykarna (Malmo Scuba Diving Club), was organising a dive trip to Norway in October 2000 and asked me if I wanted to come. I thought about it and after checking that I could get a relatively cheap flight to Europe to coincide, I decided that this was a unique opportunity not to be passed up. So I booked a flight and looked forward to the trip. The best way to get to southern Sweden (where Riki lives) for me at the time was to catch a Thai Airways flight from Sydney to Bangkok and get the connecting flight to Copenhagen in Denmark. This flight took about 22.5 hours actual time. Departing Sydney at 5.30 pm on a Tuesday evening, I arrived in Copenhagen at 7 am the next morning. The Thai flights were very good. The return flight cost me about $1580 including taxes. Riki picked me up from the Airport and after a short sightseeing trip around Copenhagen, we headed back to Lund in Sweden via the new (opened 1 July 2000) Oresund Bridge and Tunnel. I could have travelled via the train (see later). After a couple of days sightseeing, we headed off in one of the Club's members cars for the 13 hour journey to Norway. Travelling via Gothernberg we went through Oslo (Capital of Norway) and Lillehammer (site of 1994 Winter Olympics). The last part of the journey was through spectacular valleys and along the edge of fiords, through dozens of tunnels, one 6.9 kilometres long. The temperature on this section of the trip was -5°C (why do we in Australian make such a thing about the M5 tunnel in Sydney when it is smaller than many I used on this trip?). From here we went across to an islands via a 20 minute ferry trip (quite a large ferry capable of carrying a hundred cars or more) and finally leap-frogging from island to island via causeways and bridges (over built in terms of height) to arrive on Runde Island. 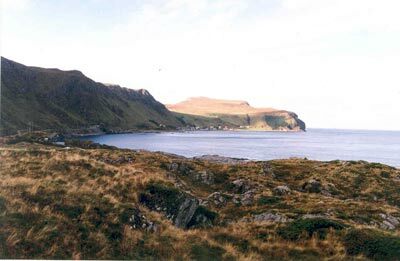 Runde Island is home to about 180 people and in early Summer, also home to about 250,000 sea birds. We arrived very early in the morning (about 9 am I recall). We were diving with Runde Dykkesenter (Runde Dive Centre) and we quickly put our clothes into our rooms above the dive shop and got our dive gear out. It was time to dive. I donned my undergarments (thermals, bear suit) and then my loan drysuit (from the President of Riki's Club - I had practised using one in Sydney). The dive boat was right in front of the dive shop so we loaded everything up into the shop's six metre fibreglass diesel engined jet powered boat and headed off for our first dive. More information about the diving can be found on on this link. If you were travelling to Runde Island from overseas (Australia, US or England), probably the best way would be to fly to Oslo in Norway. You could then fly to Alesund and catch a bus from there or fly to Bergen and catch the coastal ship to Fosnavag and get picked up by dive shop owner. An alternative is to hire a car in Oslo and drive, this is a very good option in terms of sightseeing. It is about 600 kilometres from Oslo. 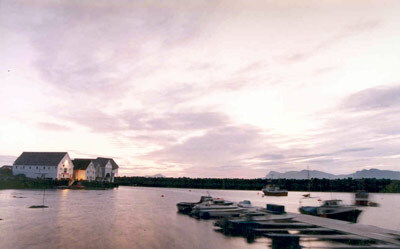 The Runde Dykkesenter was started in 1993 by CGustavsen. He has taken an old waterfront fishing building and converted it to a dive shop on the lower level and dive accommodation on the top. The accommodation consists of a number of rooms, with one, two or four beds, a kitchen, two bathrooms (only one shower! ), a lounge area (with TV, video and excellent English language movie video collection) and the dining area. There is also a dry area for warming and drying your undergarments as well as one for the outer garments (eg your dry suit, BDC etc) . The dive shop consists of the shop, office, gear storage area, wet drying area, drysuit drying area and gearing up area as well as a sauna. Outside there are some tables and chairs, gear washing tub and the dive boat. The shop has a good selection of equipment for hire or purchase. Their dive boat is a six or so metre fibreglass diesel engined jet powered boat that is well suited to the waters. It can be a bit wet when the wind is up but as you are in a drysuit and the runs are only 10 to15 minutes maximum, it is not too bad. For more information, you can see the Runde Dykkesenter Web Site (Norwegian only) or email Bjorn. The phone number is +46 70 08 59 90, fax +46 70 08 84 30. We did dives at 9 am, 2 pm and 7 pm. The 7 pm was an additional dive to the normal plan. Each dive we went out, did the dive, and then came back to the shop. In between dives we watched videos, went walking and ate food! 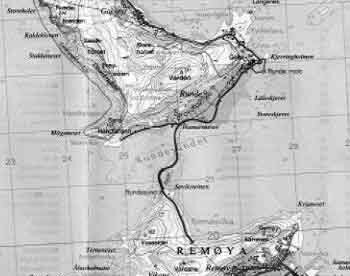 Bjorn advised me that I was certainly the first Australian to dive the fiords in this area of Norway! 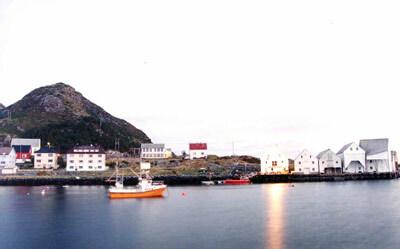 The town (village) of Runde has a cafe and restaurant but they are only open in Summer. There is a small shop that sells the basic food stuffs (and stamps, bread, beer etc). You will really need to bring all food and beer to this location for a decent time. Note that the beer in Sweden and Norway is very expensive, A$2.75 to A$3 a can (in 2002 - albeit 500ml) from a bottle shop, no matter how many you buy and spirits horrendously expensive. Wine is reasonably priced, at least in Sweden but at Runde, you need to drive for two hours and take two ferries to get wine and spirits. In Sweden we purchased a few bottles of Australian wine at prices that would have been similar to bottle shops in Sydney! Fuel was about A$2 a litre (remember 2000 prices) and some other things expensive, like cheese (A$9 for 500g!! ), cream biscuits (A$5 v $2.50 for non-cream) but most food was reasonably priced. Still better to bring most things from Sweden or more populated places of Norway. The small shop sold bread which was frozen and then cooked/heated in a microwave/convection oven and about 15 minutes later we had beautiful fresh bread. I have never seen this in Australia, either before or since. I travelled to Runde Island in October and the air temperature was 6 to 14°C during the day (it can easily be negative and snowing (in the same week in 1999 it did) and it was about -5°C to 0°C at night. Water temperature was 11°C every dive and the wind blew very strong. As indicated, the water was an almost constant 11°C right throughout the depths (0 to 45 metres). The visibility was mostly 20 metres, but on a few dives was more than 25 metres and on a couple, only 15 metres. This is at the normal depth. On most dives, the visibility was a lot worse in the shallower 5 to 10 metre area while we were doing safety stops. This was presumably due to fresh water and run-off. 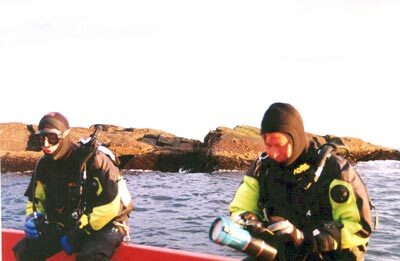 The seas were always millpond where we dived, and even on the windiest days there was only a very small chop that was only uncomfortable because the spray was blown into our faces. You could never have got sea sick! As I do not normally use a dry suit in Australia, I had to do a few test dives in Sydney before I left to get a bit of experience with the use of a drysuit. I organised with my friend Riki to borrow a dry suit, undergarments as well as a tank and weights. If you did not have a dry suit, you could hire one from the dive centre. You could also hire all other equipment from the dive centre although I am not aware of the cost of this. I took with me my BCD, regs (beware, some European tank valves are too wide for some reg yokes, notably Sea Hornet), weight pockets, fins, mask, two sets of gloves, two hoods, torch and dive computer. Most importantly, I took some thermal underwear to help keep me warm. As indicated above, our dives were at 9 am, 2 pm and 7 pm. 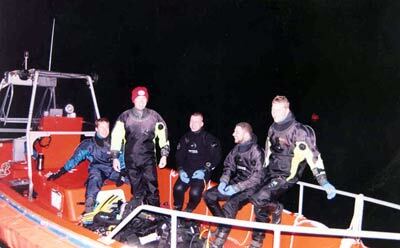 About 15 minutes before the dive we would don our undergarments up stairs in the dive accommodation area. First on was the thermal underwear, thick socks and then the thick fleecy suits (covered in nylon). Quickly leaving the warm area so we did not sweat too much, we walked down to the dive shop area where we put together our tank/BCD/regs. Next on was the dry suit before carrying the gear out to the boat. Next on was the thin hood followed by the thick hood then a pair of thin woollen gloves followed by the thickest neoprene gloves I could find in Sydney. I had anticipated a water temperature of 8°C so I was quite warm for the encountered 11°C. All in all, I was very warm except for a couple of occasions when water got in on my left forearm (through the valve). How much did all this cost? Well, For the accommodation and eight dives it was 2250 kronor. However, we did another 11 dives costing 1650 kronor (about A$30 each). 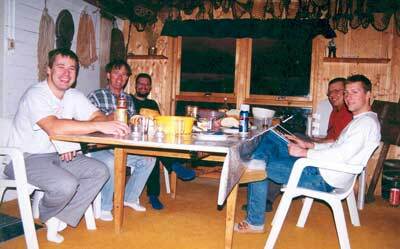 We stayed a week, did two day dives a day and one night dive on five nights, 3900 kronor. The table below gives a more accurate list of all my costs for the trip (excluding the time I spent in Sweden before and after the trip).